There are all sorts of dangers for dogs in a garden. Puppies are even more vulnerable since their main purpose in life is to explore the world. You will probably find that they often seem to go looking for these dangers and it is up to you to make the garden safe for them to be in. When I have young puppies, I don’t leave them loose in the garden, unless I can be watching them the whole time. Instead they go into the puppy playpen. This way they can enjoy being outdoors, and I can concentrate on my gardening knowing they are safe. This continues way past the time when their litter mates move on to their new homes. 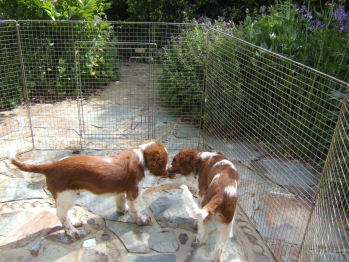 I am sure that there other places to get puppy playpens from, but mine come from Croft. The main reason for keeping watch on the puppy is that I want to avoid the possibility of them eating any plants as they explore their new world. I think I have carefully selected my plants to avoid having dangerous ones, but I would never forgive myself if I have slipped up and one of the dogs ate one that hurt them. 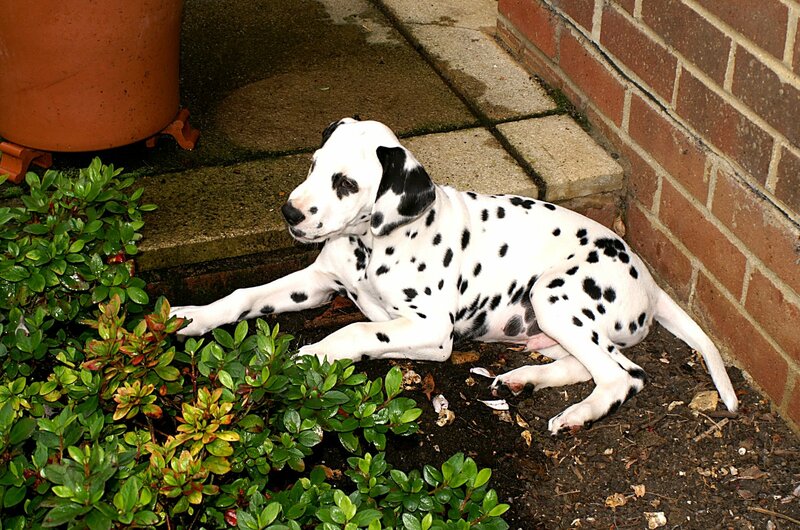 Poisonous Plants provides information of plants the may harm your dog. Remember that no list you find is likely to be exhaustive and it is probably sensible to remember that just because a plant does not appear on a list, it does not mean that it is safe. However, even if a plant can be poisonous to dogs, it doesn’t mean that you can’t have it in your garden. For a plant to affect your dog, it normally has to eat it. Also for many plants to be dangerous, the dog has to eat a reasonably large amount of them. The real thing is that you have to ensure that your dog doesn’t eat the plants. Luckily most dogs have an inbuilt knowledge of what they can and can’t eat. My dogs never try to eat the plants in my garden apart from the grass that they seem to know is safe. Teaching your dog not to eat plants is most easily achieved when they are puppies. The key thing is to teach a puppy not to chew things, which I do using the “ouch” command. I start work on this part of their education indoors. As with all commands, it is the tone you use more than the words that the puppy comes to understand. I find that the best tone in this situation comes naturally, try to say it as if you have just stubbed your toe. I start when the puppy is playing with me. If he bites (rather than mouths) me, I give him the command and keep still – just as his litter mates did. I have found it to be extremely effective with even the most independent minded puppies. Once he has learnt the lesson with humans, I move on to objects around the house. Gradually, I put more temptation in his way and he learns that when I say “ouch”, he should not chew that object. Once this lesson is reliably learnt, then he can explore the garden, under close supervision. When he tries to eat a plant, I give the “ouch” command and the puppy should leave the plant alone. Like all training, the key thing is consistency. All members of your family need to be trained to reinforce the lessons whenever it is necessary. Providing he has learnt the previous lessons well, it won’t be long before your puppy can be relied upon not to eat your plants. Once your puppy has learnt the basics of not eating plants, you will probably decide to leave him loose in the garden most of the time. However, there are other safety precautions that you should take. As discussed previously, if you have water in your garden, you will have to ensure that it is not possible for your dog to fall in. If you have a swimming pool and a dog that is not the best of swimmers, you might consider a life jacket for him. Other garden hazards are possibly not as obvious. Many gardening tools are sharp or have points that a dog could harm themselves on. It is good practise to look after your tools, even more so when dogs are about. I always keep my secateurs locked closed when I am not using them. My rake is never out of my sight and goes straight back into the shed when I have finished using it. One of the most dangerous things I use is a long handled blowtorch for removing weeds growing between the paving slabs. Whenever I am using that, the dogs are shut in the house. There seems to be no point in asking for trouble. We all know that many puppies would love to chew electrical cables. What is it about them that is so appealing? Nowadays, many electrical appliances are to be found in the garden. You must therefore extend your cable diligence into the garden too. Whenever you are moving, strimming or vacuuming your garden, make sure you know where your puppy is and that he is not munching in to the cable. It is always good practise to have a circuit breaker on your garden power supply; it can save not only your life but also your dog’s. Whenever you are in your garden, please keep an eye on your dogs. Watch out if your puppy is quiet – the likelihood is that he is up to no good. A garden is safe if you have taught the dog to have respect for his surroundings. I so wish this information had been given to me from the vet or the puppy trainer, our puppy died last wednesday after three wonderful weeks of living with our family, we have all been heartbroken.It is assumed although not confirmed that she ate something toxic from the garden,and as we garden organically I was amazed to discover the death trap which is our garden. I intend to collate as much information on this subject as possible and have the above organizations distribute it to all new puppy owners to prevent another family having the heartache that we have. Pauline – I am so sorry for your loss. Please feel free to point others to this site – I hope your loss can help prevent others. Don’t let it put you off having dogs in the garden – you just have to think a little more.